Emeka Okafor’s work catalyses African innovation. He is a co-founder of Maker Faire Africa and curator of TEDGlobal Africa, and sits on the board of the Gearbox International Foundation. Jim Ajioka is a professor of synthetic biology at the University of Cambridge. His interest is in distributing emerging technology in the developing world, and is working on projects ranging from creating an arsenic biosensor with non governmental organisations in Nepal, to Colorifix, a company developing a more sustainable fabric dyeing process. Synthetic biology is regularly promoted as a technological solution for those who are impoverished in the global south by providing food, medicines, and energy. But how often are technologies designed by the people they are being designed for? While more traditional forms of biodesign exist across Africa, the UK is investing in building synthetic biology capacity in southern Africa. Could these technologies be developed in new ways under local conditions? Emeka and Jim discuss how “contextualising technology” could encourage equity, and together, imagine new models of collaboration that could emerge. Emeka Okafor: I'm coming to this conversation not as an academic, nor as a technologist, but as someone with an interest in innovation in the developing world, especially Africa. I’m interested in how you think synthetic biology might develop in different contexts in Africa, and what things are needed to make that happen? How do you see the situation now? Jim Ajioka: Well, I think that there's disparity in synthetic biology between us—and by us I mean the US, Europe, and perhaps China, South Korea, and Japan—and the rest of the world. Basically, an elite set of countries develop the research and technology that will impact less wealthy countries, i.e. Low Middle Income Countries (LMICs). I think that's a problem. For example: drinking water in Nepal, Bangladesh, and North India is highly contaminated with arsenic. This is because twenty years ago, they started drilling shallow tube wells to get clean water to villages. These wells avoid surface water loaded with human pathogens, but unfortunately, the aquifers feeding the wells are laden with arsenic. Now, millions of people across the region are exposed to levels of arsenic that would be illegal anywhere else. The aquifers change underground; it's a dynamic process: you need to monitor your arsenic levels on a three- to four- month basis and you also need to know what to do about it. A team of us at Cambridge and Edinburgh developed a low-cost intervention that could be used in the field to test their water for dangerous levels of arsenic. If you can build a database of arsenic contamination geographically, then you can say: "The contamination in this village is really bad, so we need to concentrate our economic efforts here because people are dying faster here from arsenic than in other places." It would allow resource allocation and mitigation efforts to be implemented in a rational way. A conversation in Nepal between local residents and the Arsenic Biosensor team, discussing requirements for designing an arsenic biosensor. Credit: Jim Ajioka. We're trying to make a low cost biologically-based sensor that isn't terribly damaging to the environment either: a lot of the current chemical sensors use mercury bromide as their indicator element. And mercury is harder to get rid of than arsenic. But the implementation of this project has been really tricky from a regulatory standpoint because the use of genetically modified organisms (GMOs), mostly plants, outside contained facilities has such a bad history that, from a legal and regulatory standpoint, all use of GMOs is tarred with the same brush. We all know what happens when you try to introduce what you think is cool technology to other places: you discover that it doesn't work very well because researchers generally never talk with people on the ground before developing a technology. These conversations are really important if you want to implement a new technology in LMICs: people will have a different relationship with the technology if they’ve had a say in developing it. You need to marry up what the local people are able to do, with the types of problems they would like to address, and how they would like to apply the technology. For example, our discussions with people in arsenic-affected villages in Nepal mattered because the resulting dialogue made us change the device design. Their perception of the technology is crucial, because it's something that they will use and distribute. What a lot of what my colleagues and I are trying to do in synthetic biology is to keep work at the research level open so that innovation can happen pretty much anywhere. But research openness only helps if you have the wherewithal to take that technology and with it, financial investment, to other places to allow local innovation. Otherwise it remains an ivory tower endeavor. But if we’re talking about synthetic biology in or for Africa I want to ask: when you say “Africa,” what does that mean? I've been to many places in Africa and they're all pretty different. Are you using “Africa” in a generic way to describe a low resource area? Emeka: “Africa” is 54 countries, with significant differentiation between the resources of say, Morocco, South Africa, or the Central African Republic. It's like the difference between a city and a rural area in terms of their resource capability. I look at the challenges and ask, "Okay, which institutions, initiatives, companies, etc., across the continent occupy certain layers and capabilities?" You have something like the African Institute of Mathematical Sciences, founded in South Africa, now with four or five campuses in Cameroon, Ghana, Rwanda, and other countries. They take extremely capable students and bring them up to speed in a whole range of mathematical sciences. Similarly, there are tech hubs growing across the continent because software is so much easier to get started on than hardware. From my perspective, it’s these transnational institutions that are more compelling than those restricted to a particular nation state. Researchers and developers at Nairobi’s innovation hub. The iHub is a technology incubator focused on East African digital entrepreneurs that aims to catalyze the growth of the Kenyan tech community, helping innovators find and develop solutions that can turn into products and successful companies. Credit: Team Ushahidi Flickr. I also ask: what sorts of pathways exist for practitioners to access these technologies, from desktop hardware tools to do-it-yourself biology equipment? Sophisticated infrastructure is typically a barrier, but might synthetic biology and its enabling platforms provide an avenue for less resource-rich parts of the world to participate in high-tech activities? And not just participate, but even compete, because the tools may not be as expensive? Are there open-source, proprietary, or in-between ways that would allow people in these parts of the world to play a role that could actually broaden the space? I look at diversity as: how can viewpoints from a number of different areas enrich and provide a diversity of solutions? If we can broaden the space in which people from different areas can participate, will we have a palette of solutions that will be of benefit to everyone? As an academic, do you think that synthetic biology offers more paths? Or might the burden of cost, of equipment, and other things preclude others’ early involvement? Jim: I think you're right about diversity being about ideas and not just a head-counting exercise. The range of ideas in wealthy countries is wide because a lot comes down to material and technological resources, not because wealthy people are more creative. If we lower the material and resources bar, then you have greater capacity to generate ideas, particularly where social and environmental conditions differ. Biology is different than, say, the semiconductor industry. Semiconductors require a huge infrastructure to make it all work, and that's why there are only a few places on earth that are actually good at making chips. Biology is better in this way because it's self-reproducing; humans have exploited this for tens of thousands of years. These days, you can take a plant and grow it almost anywhere on earth. With modern molecular biology, it's really easy to make a piece of DNA and send it someplace else to work with it. Consider what will happen when we combine this portability with information and data processing tools that analyse and support large biological datasets. This will really democratize bioengineering, because you can be anywhere on earth and so long as you have access to a computer, you can design a biological system. Further, the ability to engineer organisms has massively accelerated over the last few decades. I think this will be particularly important for designing plants using powerful new genome editing methods. You could potentially collapse thousands of years of breeding teosinte, the ancestor of modern maize, down to a few months, because you will know the design rules. This will make a huge difference in our ability to engineer organisms locally. Ultimately, it’s about trying to understand or allow people to use their own creativity in a way that can be put out in a technological format. Science and technology are creative activities, and therefore diversity in the way people approach them, the way they think about them, matters. If technology was just part of an orchestrated process, it would be really boring. But it's not. How you choose to use the technology—particularly in the face of a new or different social or environmental contexts—means that ideas matter a lot. Emeka: Through various endeavours I am involved in, I try to accelerate participation in cutting edge and locally-enabling technology areas that may seem to be lagging in the “developing” world. Synthetic biology has the iGEM competition [International Genetically Engineered Machine], which seems to be a bridge for undergrads—and even younger students—to participate in the basic building blocks of synthetic biology. Beyond iGEM, how else can we encourage individuals in other parts of the world? 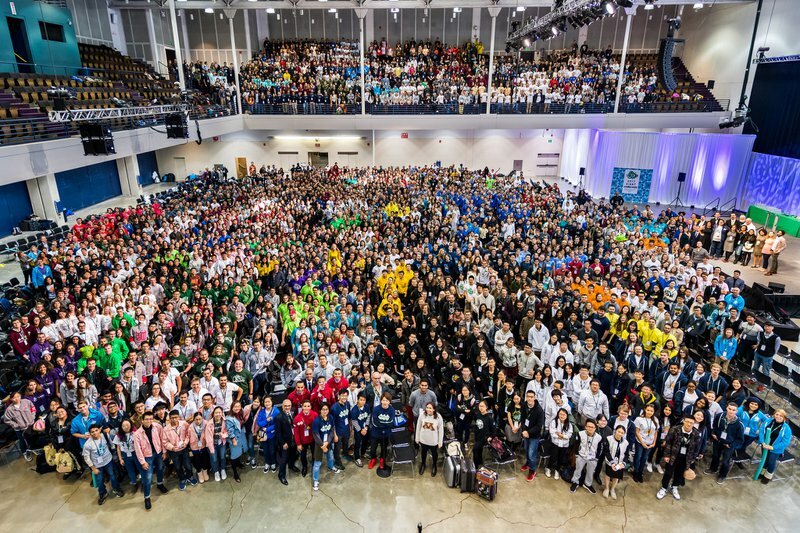 Participants at the 2017 iGEM jamboree, Boston, US. Credit: iGEM HQ. Jim: I love iGEM; I think it was really good in its conception, but it's become very expensive. It's almost excluded us here in Cambridge, which is ironic. You have to generate £30,000 to run a ten-student team for a summer. We need other, less costly ways of getting people into the technology. But iGEM’s very interesting core concept is to take biological parts based on DNA code and build devices or systems that do something cool in a chassis organism, like bacteria. The competition aspect is a double-edged sword. The first year Cambridge participated, in 2005, iGEM only had joke prizes. When it was formalised, iGEM became less fun because winning a prize became a goal in itself; some teams were heavily resourced and managed towards this end. One upside of formalisation is the emphasis on collaboration and social and ethical responsibility. Generations of students now see this as the norm rather than some strange add-on to the engineering of organisms. Instead, at Cambridge, my colleagues and I are now thinking about alternative models for participation. We're planning to run small scale capacity-building exercises in a much more cost effective, low resource way. We’re starting by developing low cost biochemical reagents for running genetic circuits without using live organisms. We can take cells, grind them up, and make a “cell-free” extract that contains most of the things that drive what the cell does naturally, but for a limited amount of time. Instead of the restrictions and costs involved in using live organisms, we can make a cell “extract” and dry it on a piece of paper. We then take our DNA-encoded genetic circuits, rehydrate the extract, and watch the circuits run through an output, such as producing a pigment. This method allows people with very little resource to design genetic circuits, run them to see if they work, and go through the design cycle. Since regulation of GM organisms is not applicable for this, and the infrastructure for growing live organisms is eliminated, essentially, it comes down to whether you can do it in your kitchen. My Cambridge colleagues Jenny Molloy, Jim Haseloff and I aim to test this out in South Africa over the next couple of years. Emeka: It’s surprising that even in the UK, iGEM has these cost implications. Are you looking to create a parallel organisation to focus on this low resource approach, not just for people in places like Africa, but across the world? Jim: To start, you have to have a testbed for how you think you can run it. iGEM began in 2003 with undergraduates at MIT doing projects during their winter break. We’ll start with some teaching and try to expand the technology locally. There are also iGEM-like competitions like TECNOx, run from South America, which is broader than synthetic biology, and is trying to open up competition beyond prizes. Whether the sheer fun of it is enough, I don't know. But for most students, making something work is motivation enough. Launching something like TECNOx with different organizations collaborating across continents would be fun. It’s all about getting other people across the globe involved in what you're doing. It may be a more equitable model: someone in a low resource area may not be able to get DNA synthesized, but could collaborate with us on putting an idea together and testing it. This work is also about getting people to talk to each other, to collaborate, and to share resources. Another approach we’re working on is making low-cost reagents available to designers who don’t have easy access to them. Jenny Molloy, Jim Haseloff, and I are trying to find enzymes used in biological reactions that have gone off patent and put them into IP-free expression vectors. Small labs could be set up as cottage industries to make enzymes, shipping them locally without a cold chain, because a lot are fairly heat stable. When I first started in Cambridge, everyone wanted to do PCR [polymerase chain reaction], which is a common way to make copies of DNA, but needs an enzyme called Taq polymerase. We cloned it because it's a heat stable enzyme and it's really easy to purify. I had my first graduate student make what was then about two million pounds worth of Taq polymerase, which supplied our lab for three years. I also gave that clone to anybody who needed it, including labs in Mexico, South America, and Africa. With a little goodwill and some enterprise, a lot of things can be done to lower the entry into the technologies related to engineering organisms. Emeka: You used the term “cottage industry,” which is close to my heart because when I hear it, I think of development. I remember reading, years ago, how in places like China, cottage industries along with agribusinesses helped form the foundation for what later became heavy industry. From an African perspective, fermentation is interesting, not just as biology or biotech, but because it’s also about food and beverages: an entire value chain. People have an immediate understanding of fermented kombucha drinks, wine, or flavorings like Asian fish sauce. But on the African stage, for example, because of colonialism and other -isms, many Africans neglected their fermentation heritage, whether alcoholic beverages, condiments, or dairy products and foods. Could one tie together the utility, purposes, and potential of fermentation industries with the path it provides into research, education, and everything else in-between? Jim: I agree. Promoting fermentation is a good idea because the principles of microbiology are the same, regardless of whether you're trying to grow kombucha, make beer or produce Taq polymerase. You still have to understand how the organism grows and works to make the product. It’s an on-ramp into biotechnology and related education. It’s a really interesting idea to take the cottage industry standpoint to get people to see how a particular endeavour or technology works, and find other context-specific applications. Emeka: A friend of mine, Ndidi Nwuneli, wrote an article about the misalignment between the 60 or so agricultural research institutes in West Africa and customers and farmers. The institutes are focused on the needs of their sponsors and carrying out their missions, but they neglect the consumers, farmers, and producers/practitioners on the ground. By linking cottage industry with research, could we make something more relevant to the people who understand it? The synthetic biology and neo-fermentation space could help tie these things together. "Well, that’s an interesting fruit you're fermenting. Could it be turned into this product?" Jim: That’s relevant to our new company, Colorifix, where we’re using microbes to produce natural colourfast pigment dyes, which both dye and fix the colour into the fabric in one biological process. It was inspired by an observation that I and probably tens of millions of other people have made: mildew, a microbe growing on a towel, stains the fabric black and doesn’t wash out. This is a manufacturing process! Today, the textile industry is the second-highest polluter on the planet. Our motivation for starting a company comes from seeing water in Kathmandu become massively polluted by the fabric dyeing and leather tanning industries dumping their highly toxic waste directly into the waterways. The Colorifix process, from engineering a microorganism to produce a natural pigment, to the end result: a colourfast dyed textile. Credit: Jim Ajioka and Orr Yarkoni. We did a lot of evening and weekend experiments to refine the process to use a genetically programmed microbe that makes purple and blue, and which will deposit and fix the pigment onto fabric. These experiments led to a novel discovery and then a patent. We took what was observed in the natural world and converted it into an industrial process. Hopefully, it'll be useful, and really distributable. You can pretty much do it anywhere since it’s based on fermentation. It’s criminal that low income countries must turn to the clothing industry to build an economic base, because they can be globally competitive without a huge infrastructure investment. But the cost is the exploitation of cheap labour and a lack of regulation. We're looking at how to make a circular economy where our waste turns into another valuable product. The takeaway is to always look at your waste as another reagent. I'm too old to worry about being a bazillionaire, but it’s fun to think about saving the planet from a few nasty chemicals. I'd love to see people looking in their local environment for interesting colours. DNA sequencing will become so cheap that they could get a sample of something from the soil, have it sequenced, and then interrogate the gene expression pattern to figure out what's driving the color production. Lots of different traits could be handled the same way. Another way to encourage more participatory biodesign is to put together low cost instrumentation. At Cambridge, we have engineers building a really low-cost microscope for looking at water samples. For my lab, I’m building a way to look at DNA with blue light, rather than the usual UV light. It doesn't break up the DNA as badly, and it's a lot safer for the user too. You can now buy blue LEDs cheaply, then add a transformer and make a blue plastic filter to put on top. The commercial ones cost £500, but only cost about £10 to make yourself. I want anybody who has a plastic source to be able to put these designs together. The OpenFlexure Microscope designed by Richard Bowman is a 3D printed open-source microscope that can be made and assembled virtually anywhere. It could be used for education to water quality assessment. Credit: Richard Bowman, WaterScope. Emeka: We need a GitHub for this space, like they have in software development, because there are so many initiatives and efforts without a central access point. I think a lot is going to be organic in terms of how it develops. The key is having the right elements and initiatives in place; but it’s hard to know how to direct them in advance. Jim: I’m curious: has your background provided those elements, the framework, for the evolution of your thought processes? Emeka: Our household was unusual by Nigerian standards. It encouraged curiosity and experimentation early on: whether it was rock collecting because of my geologist and mining engineer father, or the brewing of beverages via my mother who was a teacher and an entrepreneur. These seeds were planted early on. I would argue that the Nigerian, and more broadly the African, educational system remains at odds with encouraging the exploratory mind. It doesn't foster curiosity, or problem solving, but focuses more on rote learning and passing of exams. I grew up on a diet of Scientific American and Popular Mechanics, which were a challenge to get hold of in Nigeria back then. I was also into science fiction. I was particularly struck by how many of these fictional worlds were not ones in which Africans participated. Yes, there were well known writers and intellectuals, but their work was somewhat devoid of future possibilities. Science fiction from Africa was not yet a thing. I was following breakthroughs at places like MIT, from afar, while being somewhat ignorant of any local research happening at the time. I began asking why more ideas weren’t coming from Africa. Were we not as bright? Or ingenious? Or as inventive? I would look at scientific publications and there was a dearth of Africans holding their own in science or technology. This didn't make sense to me, because growing up, I saw a doer mentality in Africans who didn’t necessarily have scientific or technological credentials. I’d see a great fabricator of agricultural machines working at a very fundamental level. But they were not the kind of person that the political class or the elite would support or foster. The makers, the doers, the people who were visualizing what needed to be done in African societies, all seemed to be isolated and marginalized. This didn't add up for me because the Edisons or the bridge builders who created the industrialized world were always at the forefront. In the 90’s I came across a couple of books written by the economist George Ayittey: Indigenous African Institutions and Africa in Chaos. At last! Here was someone who was highlighting the importance of “production as a culture” along with “cultural heritage” as a resource. But in Africa, the ruling class—the political elite—was in office primarily for material gain, exploitation, and extraction of natural resources. They were not, and still are not, thinking about and supporting the makers and doers. This realization was a key moment for me. Jim: I grew up quite the same way. My father too was an engineer, we didn't have the internet, so we went outside to play, constructing things from tree houses to hot air balloons and rockets. But my educational system in California was more liberal: we weren't drilled all the time on passing exams. We had to do projects, which helps students explore their universe through their imagination. When I was a kid, I also subscribed to Popular Mechanics; it’s cool that these kinds of magazines were also in Nigeria. I loved that magazine because it not only told you how machines worked, but also how to build stuff. My choice for university was architecture or biology. I chose the latter, but I'm sure I would've been just as happy with architecture. And your interest in geology is also quite a parallel with my own! I had friends whose parents or grandparents were geologists, so we'd go be rockhounds in the desert in Southern California. We'd get our rock hammers out and look for geodes and all sorts of weird things. Where I grew up there were lots of fossils; it’s one of the richest mammalian fossil deposits anywhere. The curiosity in my life was quite similar to yours. Your affinity with people that are doers also really resonates with me. All sciences are observational in the beginning, but like you, I like being with people that want to go out and do stuff. For me “doing” means experimentation or building things. Can you expand on the process of actualization? Emeka: Part of actualization is changing the story. Not by telling feel-good stories, and saying “I am African. I am proud,” but by adding more context: “He built a good engine,” or “Have you seen the amazing textile this person has woven?” Respect is something that you have to earn through real work. Among intellectuals in Africa there has been, to some extent, a culture of complaint: “All these things have been done to us, so everyone else owes us something.” This is a diminishing narrative that removes personal agency. The differences are interesting between how various African and Asian countries looked at what they needed to do to develop. Why are South Korea and Ghana at such starkly different levels of development? The reasons include a comfort in taking shortcuts; shortcuts that overlooked native and homegrown methods of solving problems. A society needs at its forefront those people who make, produce, create, and build. They are the ones who implement change. After studying architecture, I started my blog Timbuktu Chronicles, which enabled me to have an open conversation about multifaceted African realities and possibilities. To a large extent this was manifested in my curation of TEDGlobal 2007 and again curating TEDGlobal 2017. At both of these conferences we brought together people who were doers, implementing what they were talking about. In some ways it became a rallying point to challenge assumptions about what the continent needed to do to develop. Jim: That’s powerful self-reflection. Can you talk about some of your activities aimed at actualization, at changing the story to be more aligned with your operating philosophy? Emeka: I think of stirring those animal spirits within the African mind and why it is necessary that we craft our own way. But doing this requires a certain degree of introspection. I think this is one reason why we started Maker Faire Africa—to get beyond conferences and into the nitty-gritty instead. Who are those inventors? Who are those makers? Maker Faire Africa 2010, Nairobi, Kenya. Credit: Maker Faire Africa Flickr. DIYbio workshop at Maker Faire Cairo, 2012. Credit: Genspace. When we had the first event in 2009 in Accra, Ghana, a press group asked us why we feel it’s important to highlight makers and inventors. Well, if you look at industrialization in many parts of the world, it was the artisanal class that provided the basis for it. You didn't have some cookie cutter mechanical engineer dropping in from Mars and building an airplane! The airplane was developed by bicycle engineers or people like that! At our first event, it was an unsurprising irony that people who were largely outsiders were the ones showcasing a snapshot of the countries ingenuity in its rawest multidisciplinary form. An example of an elite disconnected from its most important resource: the inventiveness of its people. Jim: This is really interesting because it illustrates a disconnect between the political and economic elite who just don't have anything in common with the doers, in part because they never interact. I think this is true not just in Africa, but globally. As a point of contrast, in California, the emerging financial elite are also technologists. It's okay to be a geek there; in fact, they’re revered in places like Silicon Valley. Yes, the Silicon Valley geeks have amassed great wealth, but they can also drive the agenda by contributing back to society via social or educational philanthropy. Maybe that’s something that needs to be examined, but from an African perspective. What would you like to see going forward? Emeka: The key thing for me is a reimagined form of education. Not as traditionally defined, but as a continuous lifetime process; education that equips us to deal with a world that is continuously changing. I think there's something enriching about learning from places that we don't expect to learn anything from. Is there an approach to pedagogy in rural Malawi that could be of value in Brazil or in the United States, or vice versa? I think this openness from a whole range of areas—from biology to architecture to economics—would be positive, whether in Africa or lesser developed parts of Asia. I think playing a role in opening up those channels and moving those boundaries is a very exciting prospect. Jim: You and I think very much the same. We do need to be more flexible and use our education and imagination to break down barriers between different kinds of institutions. People need to be much more imaginative about what they can do with their education and training. I feel slightly hypocritical saying that because when I was making those decisions, it was possible to choose a single career path. But times change and this creates new opportunities too. Over the past decade or so, my colleagues Jim Haseloff, Gos Micklem, and I have tried to open up the University framework to create new educational avenues and change some of the ways that we run education. Examples of this at Cambridge are cross-department courses like Introduction to Molecular Bioengineering and broader initiatives like our Synthetic Biology Strategic Research Initiative. We envision multidisciplinary workspaces that allow people to play more rather than being drilled with information. Our current curriculums bludgeon the creativity out of students. We see many students in Natural Sciences going into management consulting or banking because they’ve developed good, flexible mind tools. But those paths don’t really facilitate making things or extending our knowledge of the natural world. Again, this comes down to attitudes about the economic and political elite versus people on the ground, who tend to be doers. I’d like to see that change. Emeka: Do you think certain Western economies like the UK or the US could be ceding ground, both in biotech and other technology areas, to societies that are more aligned with real value creation? And by value creation I mean value that’s useful to society, not just shuffling money around. I think that if you're not creating value that’s useful to your society, then you will cede your position to other societies that are more productive. Jim: I think there’s something to that. I’m not an economist, but I think by levelling the technology playing field globally, we’ll all benefit because value creation sometimes rides on the back of exploitation of others, including the foreign acquisition of key natural resources and cheap labour. Supporting the doers within a region should encourage local value creation and lessen dependence on foreign aid. I’ve recently been awarded a Global Challenges Research Fund (GCRF) grant. The UK government has redirected money that might have gone directly to foreign aid to support scientists and engineers to work and interact with counterparts in LMICs. The grant is very new and very practical: we aim to engineer and develop prototype biologically-based, low-cost viral diagnostics. It might be a really good way of getting mindsets and educational methods to change because the work includes South African partners, with a strong component of outreach and education. A lot of it will be about opening people's minds and giving them the opportunity to tinker. I like the idea of putting money into these kinds of endeavours, where part of your remit is to allow people access to basic technologies that underpin real-world industries, or address real, local problems. This lowers the activation energy to get into technologies. I think that’s what I'll be doing for the remainder of my career: not just research, but building low-cost biological devices and trying to get reagents and products out there that can be utilized by other people without massive restrictions of IP. Emeka: Providing more access points is key here. I think that as labs, accelerators, incubators, and hybrid spaces become more common they will provide a framework for developing new processes and products for building localised bioeconomies. I'm personally working on a project in the food and beverage space, so I’m wondering if we could start to conceive of breweries as a kind of nonlinear educational location. Spaces like this could also become “Petri dishes” for fostering innovative thinking in more ways than one: combining business, education, and the facilitation of similar areas of focus for others. We need to find ways to propagate these ideas and replicate them across the board. Jim: New technologies should allow people to create industries and wealth to benefit their societies in ways that suit them. Emeka: Yes, and not because someone from the outside is telling us to live differently: like a do-gooder from New York flying into Kenya, wagging their finger, and saying you shouldn't eat meat, while they've been eating steaks all their lives. Instead, maybe lab-grown protein could take off more quickly in Sri Lanka than it would in America. Jim: Assuming a basic knowledge of the relevant technology, I think it’s inevitable that novel processes and products, biotech-oriented or otherwise, will develop in unexpected places. Each society has a slightly different way of doing things. I went to Japan a few years ago to give a talk and the students asked how they should go about developing new research ideas. My response was: don't listen to your supervisors and think for yourself. That really shocked them because in Japan the culture is very hierarchical. I said I was joking, but I was actually being very serious. By thinking for yourself, you can do unconventional things and develop new ideas. What we're doing with Colorifix it isn't just about trying to make a better commercial dyeing method, but changing the way that we look at manufacturing, making it a more sustainable process. Regardless of whether or not we succeed, we'll still make an impact by making people think about how conventional fabric dyeing has developed through the petrochemical industry and how to look at alternatives. “Disruption” here isn’t just a business model, but more about societal change. I hope we can make people think more deeply about what they want to do with technologies that they're developing; or more precisely developing technologies within a framework that they see as useful in their society. For me, it's about helping people to think for themselves and to consider what they would like to see in their environment. You and I share the hope that by combining education, social awareness, technology, and business within a shared space, the resulting growth of local economies will lead to more equitable global benefits.